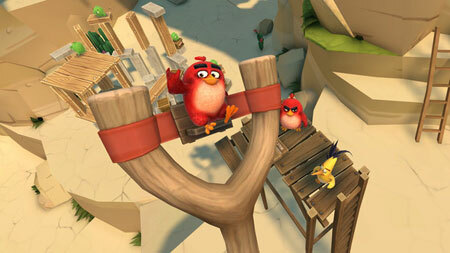 Angry Birds VR: Isle of Pigs is an immersive VR adventure game from Resolution Games. Join Red, Chuck, Bomb and the Blues to save the stolen eggs. Discover the remote island where the greedy green pigs take their vacation in more than 50 fun-filled levels. Make your way up to party city through exotic beaches, steep cliffs and snowy slopes, destroying their structures in the most spectacular way to earn those all-important stars. Choose from different angles to make your slingshot, using classic Angry Birds gameplay elements to progress and strive for the best possible score. Tough boss pigs, balloons, boulders and fans make each level a challenging puzzle in its own right. Using the bird’s special skills will help you earn maximum points. If you get stuck in the game, check out the video walkthrough and gameplay for the game. This entry was posted in PC Games, Walkthrough and tagged Angry Birds VR: Isle of Pigs Cheats, Angry Birds VR: Isle of Pigs Gameplay, Angry Birds VR: Isle of Pigs Guide, Angry Birds VR: Isle of Pigs Strategy, Angry Birds VR: Isle of Pigs Walkthrough by Marvin. Bookmark the permalink.